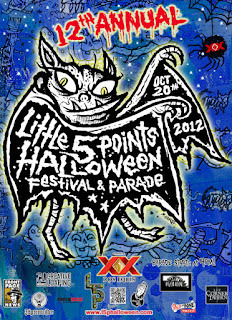 We look forward to seeing you and yours October 20 for the 12th Annual Little Five Points Halloween Parade. Atlanta's favorite spectacle, slightly tamer and more kid friendly than in years past, kicks off at 4 p.m. Come early to enjoy a perfect fall day in Inman Park and the thrills of the 16th hippest neighborhood in the U.S with its hair down. Parking in Little 5 will be tough going, so ditch your car in Candler Park or on Sinclair or Lake Avenues in Inman Park and stroll towards the mayhem. After the parade you can head to the new Cameli's Pizza location on Moreland Avenue for great food and a live outdoor performance by Gringo Star. Even odds I will be there dressed as the Annoying Orange.